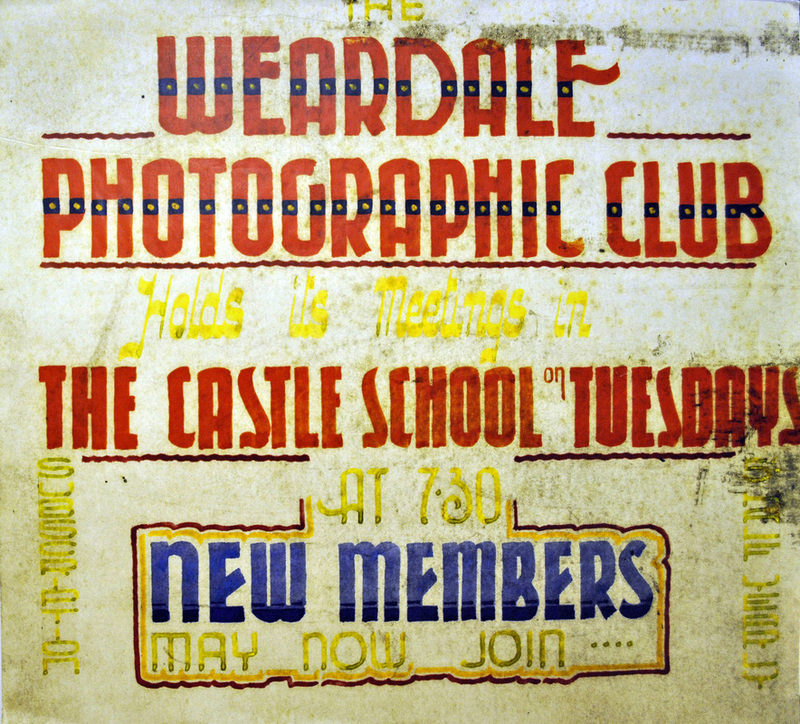 'This is believed to be one of the first posters' advertising the formation of the 'Camera Club 'that became. 'Stanhope Photographic Society' it was discovered in Stanhope Newsagents by it's current owners. The Society was founded by a group of enthusiastic photographers who attended evening classes at the Barrington Hall at St. John's Chapel. 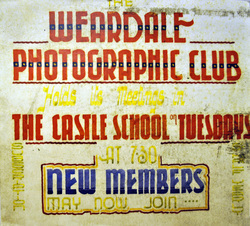 Due to the withdrawal of the evening classes in 1966, eight local photographers who attended the classes decided to meet and discuss ways of preventing the disbandment of the group and following the meeting held in the Barrington School, Stanhope on Tuesday 25th October 1966, it was decided to officially form a Photographic Club and it was named 'Stanhope and Weardale Camera Club'. Messer's F. Burdis; G. Brown; Rev. Graham; W. Holden; G. Turner; E.J. Walton; R. Winter and G. Wall. From the inaugural meeting the 'Stanhope and Weardale Camera Club' was formed and an invitation went out to like minded individuals interested in photography to join the group. Following the inaugural meeting, the Club arranged to meet once a fortnight in the 'Phoenix Hotel' Stanhope, the membership increased from the original eight members to thirty-two members within twelve months. The topics covered by the members of the Club were 'Colour Photography; Black & White Photography and Cinematography (Cine). The Society over the years have held meetings in several venues including Stanhope Castle; Stanhope Community Centre and several hostelries be fore moving to it's present meeting at St. Thomas's Church Hall, Front Street, Stanhope. With the aid of the grants the Society purchased, Digital projectors; laptops; printer; slide/negative scanner; flatbed scanner and a large projector screen. Several members attended digital evenings held on additional Society meetings. Members range from beginners to accomplished photographers, ages range from 16years to the Societies eldest and one of the longest serving active members is Mrs. Jenny Gray (1968) who was 101 years young in June 2016.. Founder member Mr. Frank Burdis (September 1966) is still a member of the Society, other long serving members are Mr. J. Banks (L.R.P.S; D,P,A,G,B) (December 1966) and Mr. J. Allen (1967).